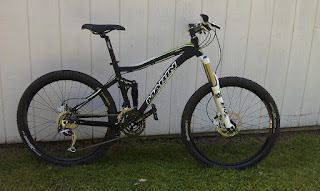 In an attempt to get myself back in shape and exercising again, I picked up a new mountain bike late this spring. As I've written about here before sometimes I need a little kick to get myself interested and motivated in exercising and the last time I tried to get back into cycling I refurbished my mid-90's mountain bike into an orange cycle-path cruiser and, still, I just couldn't get back into it. 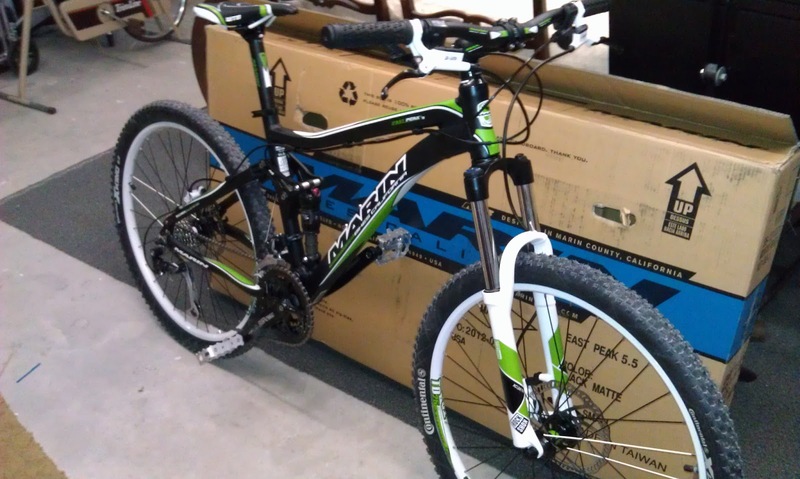 So this spring I decided it was time for a new mountain bike. First, though, I have to have a little nostalgic flashback: Bikes have changed a lot since I was really into them in the mid to late 90's! Back then 26" was the only wheel/tire size for mountain bikes but now there's 29" and 27.5" (650b) and 26" wheels have fallen out of favor except for downhill and all-mountain bikes. Not to mention that there used to be "mountain bikes" that people rode both up and down hills but now the "mountain bike" classification has been split up into more specialized categories. I've seen bikes classifed as recreational/sport, cross country [XC], freeride, all-mountain, enduro, gravity/downhill, dirt jump... and I'm sure there are others that I've missed. Also, in the olden days, there were a decent amount of quality steel frame bikes available. Now, if you can find them (not counting the hi-tensile department store "steel"), they're mostly custom built high-end (expensive) creations. I remember liking the ride of a good steel frame and thinking aluminum alloy frames (which were on the more high-end of the specrum) rode more harshly. Now alloy frames are the most common with quite a few carbon fiber frames available in the high-end and expensive range. A new (okay) entry level suspension fork could be had for less than $100... Now the (okay) entry-level forks are closer to $200-300 and they're heavier than the ones I remember. I also don't remember tires costing $50-100 each. So, back to my story. I'd always wanted a full suspension mountain bike... and I happened to find one on eBay at a very reasonable price this spring at the same time I had my tax refund money burning a hole in my pocket. I could do something responsible like put the money in the bank or towards some debt... but I'm a good consumer and I'd rather have a new bike. I wasn't sure whether to try out a 29'er or wait for 650b bikes to become more common in the local shops. (I haven't actually seen one in a shop or been able to ride one yet.) But I happened to come across a new (overstock) 2012 Marin East Peak 5.5 in matte black with white and green accents on eBay. It is a 16.5" (small) frame with 26" wheels (which I'm comfortable with, especially with me being 5'8" tall and it being a 120mm travel full-suspension bike), an entry-level RockShox suspension fork and mostly decent entry-level Shimano Alivio 3x9 componentry. I then went to town on PricePoint, Bike Nashbar and eBay finding mostly Shimano XT components (hydraulic disc brakes, derailleurs, cassette, hubs [with Mavic rims]), XTR shifters, Ergon grips and a Fox Float 32 RL fork at really good prices. The only stuff really left to do is to continue to ride and get used to the bike and customize my fit (handlebars, stem, seatpost and saddle) and then shorten the brake lines once I get everything dialed in. I've been off-road a few times on it and it's been great so far both up hill and down. To get some miles in on the bike and get stuff dialed in, I've actually been doing some bike-path cruising on it and with the fork locked out and the rear shock pumped up, it's been okay for that, too!